It started a couple of years ago. I was trawling YouTube for inspiration for a book I was thinking of writing, idly browsing caving videos. 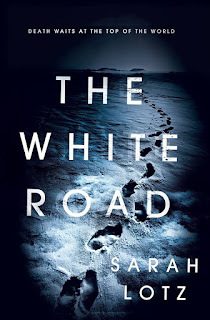 All I knew at that stage was that I wanted to write about an adrenalin junkie who has an unfortunate experience when he breaks into a cave that’s been out of bounds for years (I should probably point out that I write commercial horror fiction!). 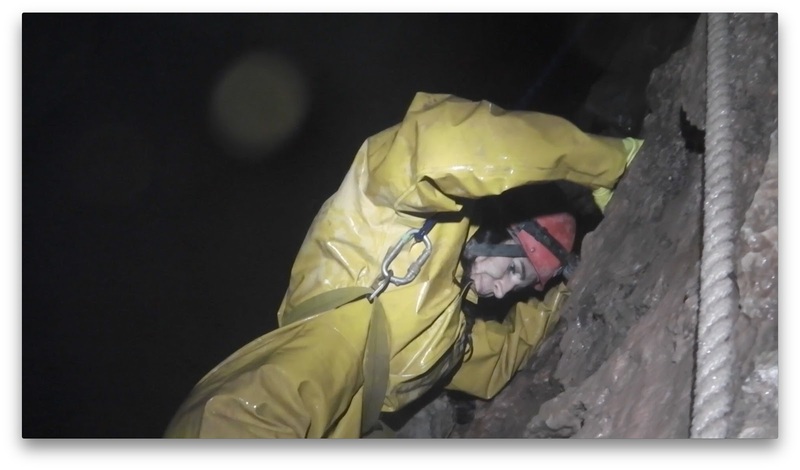 Top of the heap were a series of superb clips by Keith Edwards of the Dudley Caving Club, which left the other videos in the dust (in the acknowledgements of the book I call him the Spielberg of the caving scene – although I suspect Keith has a far keener sense of humour). I was on the edge of my seat watching them, peering through my fingers like I used to do as a kid when the scary bits of Doctor Who came on. I contacted Keith, and asked him if he’d be prepared to let me pick his brain about the caving scene. He did much more than that; he invited me to visit the windmill and offered to take me underground. Everyone I met at the windmill was welcoming and kind, even though I’m fairly sure they all thought I was bonkers. Talk turned to which route to take me. I’d heard somewhere that if you go underground for long enough, when you emerge you can smell what the air ‘really’ smells like. It was Mark who suggested we do the OFD 1 to Cwm Dwr through trip – five hours should give me that. And so my husband Charlie and I set off to meet Keith, Mark and Brendan on a drizzly Welsh morning. I did get to smell what the air ‘really’ smells like. That and much, much more. The trip wasn’t easy, but it was bloody brilliant. 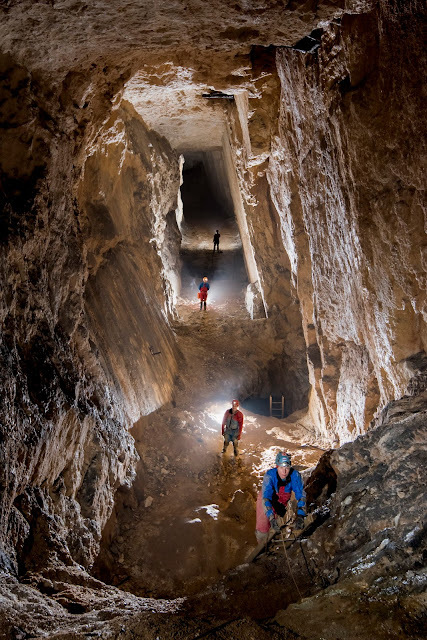 And I got the inspiration for half a novel out of it (the other bit is set on a mountain), even if I did get some of the caving terminology wrong. And you have to have one to take a neurotic writer and her gung-ho husband under the earth for five hours. It was a big ask, especially as I had zero caving or climbing experience (I have a condition commonly known as laziness), and Charlie is at the other end of the scale – he has no fear. Keith, Brendan and Mark told us exactly what to bring, were endlessly patient, and at no point, not once, did they ever lose their cool. Brendan even took a photograph of us balancing on a pipe on top of a churning pool, which took a great deal of setting up and generosity. 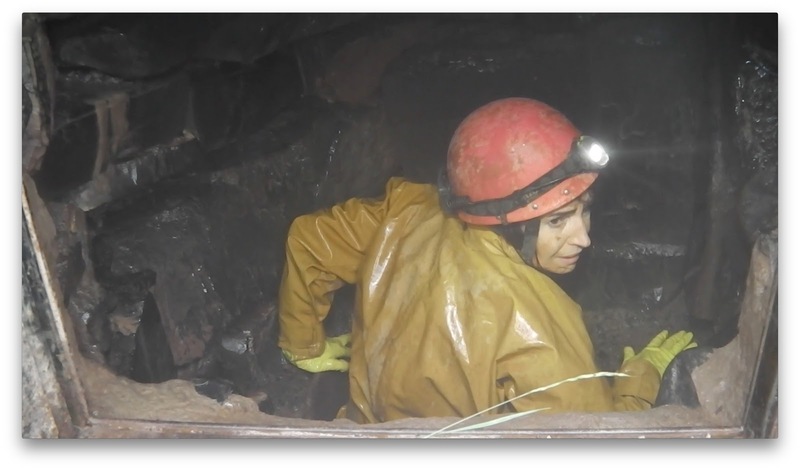 In one of Keith’s Cwm Dwr videos there’s a moment where Mark gets stuck in a pipe (I can’t tell you exactly where on the vid it is – I have only managed to watch it once). Those few seconds of footage made The Descent look like Bambi and gave me nightmares. This trepidation was fuelled by Capetonian friends who, on learning I was going down a big hole, all had horror stories about people getting stuck in the notorious Cango Caves, trapped in a funnel for hours with nothing to look at except an American tourist’s giant arse. 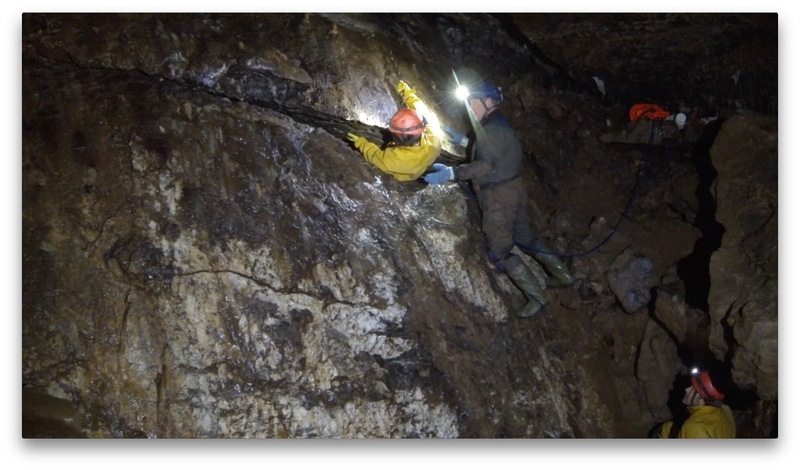 But when I was actually underground, the squeeze bits were my favourite – I loved every second of corkscrewing our way through a boulder choke and scrabbling along a squeeze the height of a microwave. And I didn’t experience one second of claustrophobia. I put this down to the head-lamps, which were far brighter than I expected, and the fact I was being shepherded by the best in the business. I’ll put my hands up and say that I fudged this in the book and made it a thousand times scarier than it actually is. (I’m a horror writer – if I don’t tap into people’s fears then I’ve failed). But I have told everyone I’ve met since writing the novel that claustrophobia really isn’t an issue and was the least of my worries. And when I say it was the least of my worries, see below. There was one point (shortly after we were posted through the letterbox) where I had to be winched over and down what looked to me to be a bloody great sheer cliff (and what everyone else termed a ‘small ledge’). 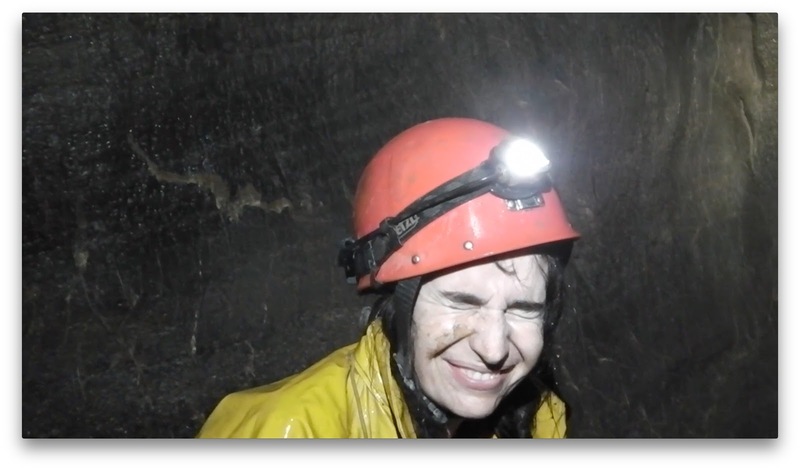 I did have a bit of a cry on the way down (especially when I realised Keith was filming me). Keith, Brendan and Mark lowered me down inch by inch, never once losing patience or calling me out for being pathetic. Charlie showed me up and crawled down there like a monkey. I did things on that trip I never thought I would do: reaching for a chain and dangling backwards over the unforgiving stone floor; being shoved up a slippery pipe; being hauled across the yawning maw of a plummeting ravine (more a crevice, but still). And although I couldn’t have been further out of my comfort zone (and admittedly had a bit of a meltdown) I never once felt unsafe. At one stage I remember looking up and seeing Mark scooting up a rock face like Spiderman, and then peering down at us from what seemed to be a huge height. I still have no clue how he got up there. Charlie practically had to be held back bodily from having a go at this. 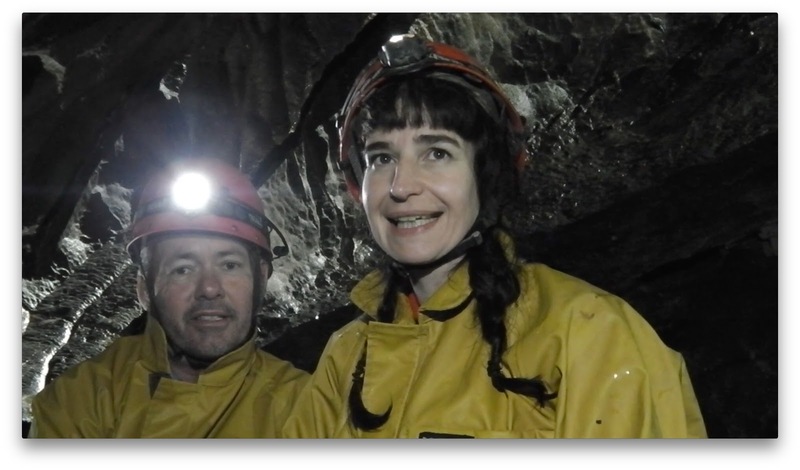 As Keith had just explained to me in detail how difficult it was to get an injured person out of a cave (and we’d passed a crevice in which a young woman had been trapped for hours), we wisely dissuaded him. There are many things I took away from this experience: That anyone can go caving if they have a crack team with them (even unfit foul-mouthed writers). That the sport is beyond exhilarating, and the unique perspective you get from being under the earth is priceless, rewarding and like being in another world – something few people get to experience. In short, it’s a real privilege. But most importantly, that the people who make up the caving community are generous, funny and pretty much unshakable. Keith, Mark and Brendan have a cameo in the book as the rescuers who show up and risk their lives to pluck Simon out of his fictional cave when he runs into trouble (inspired by Keith telling me that only cavers can rescue cavers). I thought this was fitting, as I could picture them doing that. Thank you, Dudley Caving Club. The novel couldn’t have been written without you. The book was published in the UK on 4th May 2017. With Dudley Caving Club it's not just about underground exploration, our weekends away are packed with subterranean shenanigans and other fun activities like eating ice cream, walking along a seaside pier, geocaching and hanging about in karaoke bars. Mines featured: Great Orme, Croesor, Rhosydd and Hendre Spar. After a much better nights sleep we chose Tunnel Top Entrance for our relaxing Sunday trip. I had done this years ago with Andy G & all I could remember of the trip was that navigation wasn't always straight forward and that it was quite physical. We headed up the hillside above DYO in beautiful sunshine. I had managed to persuade Loz to 'Offer' to carry the rope up and so was enjoying the stroll. This was a far cry from the first time I had attempted to find the entrance and had wandered for almost 2 hrs before discovering it. This time we headed straight there. Loz's mate Michelle was going off walking and so we got her to be our call out. 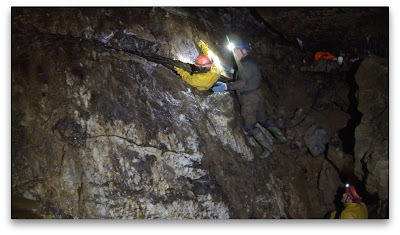 We again made swift progress down the pitches and traverse and were soon heading in to the cave. We kept high and right and aside from a single blip had no issues with navigation. The trip is pretty physical and uses quite a bit of upper body strength and both Loz and Kay were getting pretty overheated. We had planned to go off and explore a bit but decided that could wait for another day and so picked our way back through the passage taking note of the other routes as we passed them for a further trip in the future. 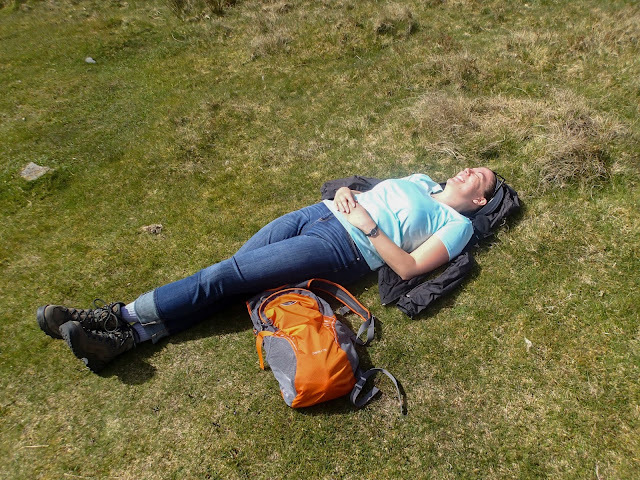 Loz de-rigged on the way out and we emerged from the cave to find our call out anxiously awaiting us......well actually she was asleep on the grass, but I'm sure it was anxious sleep though! Success! we made it to the airlock door. Michelle anxiously awaits our return! Kay and I headed down the SWCC on the Friday to get a decent nights sleep before our big trip on the Saturday. 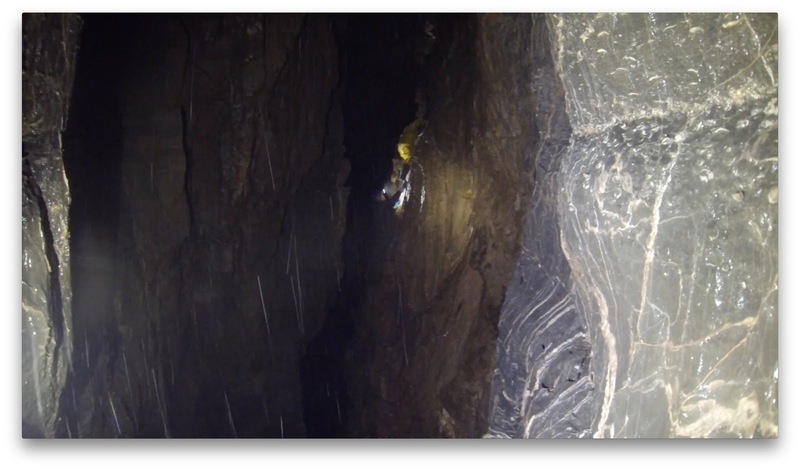 Unfortunately Plymouth Uni had other plans and were outside partying till 4.30am, at which time they decided a spot of naked caving was on the plans and headed off to Cwm Dwr! We met Los at the DYO car park at half ten, kitted up and headed in. Low water levels and only taking a point and click camera meant we made good time and we took the usual round trip route past Cloud Chamber in. Only a single ring was available at the green canal and so Kay elected to get wet whilst Loz and I went over the top and abseiled down to join her. Our swift progress continued as we made our way up the Rising and through to the Great North Road. After Pinnacle chamber we decided to take The Meanders in to the cave and after just under 4 hours were sitting at the final choke. As Kay had never been to this part of the cave before we went for a look at The Mostest on the way out and headed back via The North Bypass. We took the lower series out and were back in the sunshine eating cake for 7pm after a good 8hr trip underground. After the previous days outing I was beginning to think mines weren't really going to be my thing, but quarter of an hour of walking through pretty woodland we were climbing down a laddered shaft and in to large, well sculpted passage which immediately appealed to my photographic side. There were enough obstacles that Keith was able to take some video and the trip itself offered enough variation that it satisfied all. Fortunately Heather had overestimated our dedication for documenting the mine and we exited in to sunshine at about 3pm. 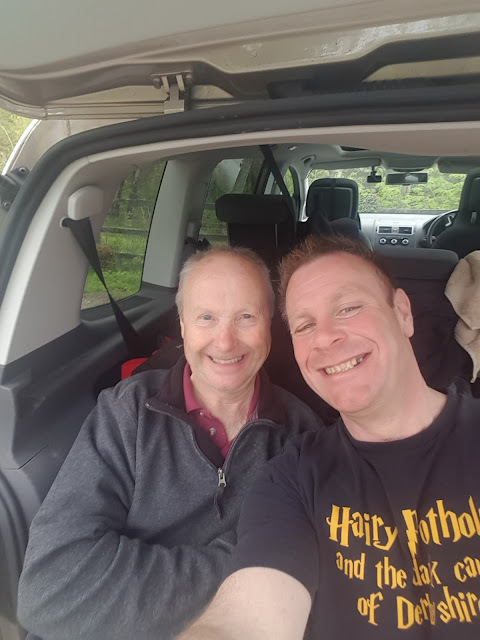 We tried for a quick drink before heading our separate ways but were unable to find anything open and so bid farewell to each other and our leaders and headed home after another successful Dudley caving meet to start washing our kit! Me and my mate survived a whole weekend of mining.....and we didn't die or nuffink!